The built-to-order vehicle can withstand an explosion of two hand grenades detonated simultaneously below the limousine's floor. Additional options include biometric gun safes and heavy-duty exhaust fans for cigar lovers. It’s not just the lifestyles of the rich and famous that differ from the rest of us. It’s their rides, too. Case in point: the 2019 Armored Cadillac Escalade ESV Chairman Package. The built-to-order vehicle costs $300,000 to $500,000, a steep upgrade from the regular Escalade ESV, which starts at $78,195. “For these types of vehicles, we are either approached by the people who will be riding in them or their assistants,” said Arthur Yurovitsky, vice president of marketing at INKAS Armored Vehicle Manufacturing in Toronto, which customizes the Escalades. In some cases, “We’re approached by corporations for executive fleets or embassies and consulates for their ambassadors or diplomats,” said Yurovitsky. The vehicles INKAS customizes and sells include Escalades, Chevrolet Suburbans and Mercedes-Benz S-class SUVs. It also builds law-enforcement-grade vehicles, armored bank trucks and, most recently, cannabis transport trucks for customers in states such as Michigan where pot is legal. The company’s customized limousines are far pricier than the cannabis or bank trucks. The limousines can be made armored or unarmored, also called “soft skin,” he said. And, the company will customize the ride for whatever the client is willing to spend. INKAS started its armored limousine division in November 2013, driven by the very practical aspect of traffic congestion reaching all-time highs, especially in certain parts of the world such as Asia, South America, the Middle East and Africa where people “spend hours in their vehicles,” said Yurovitsky. “If you’re a diplomat or head of state you want to be productive wherever you are,” Yurovitsky said. 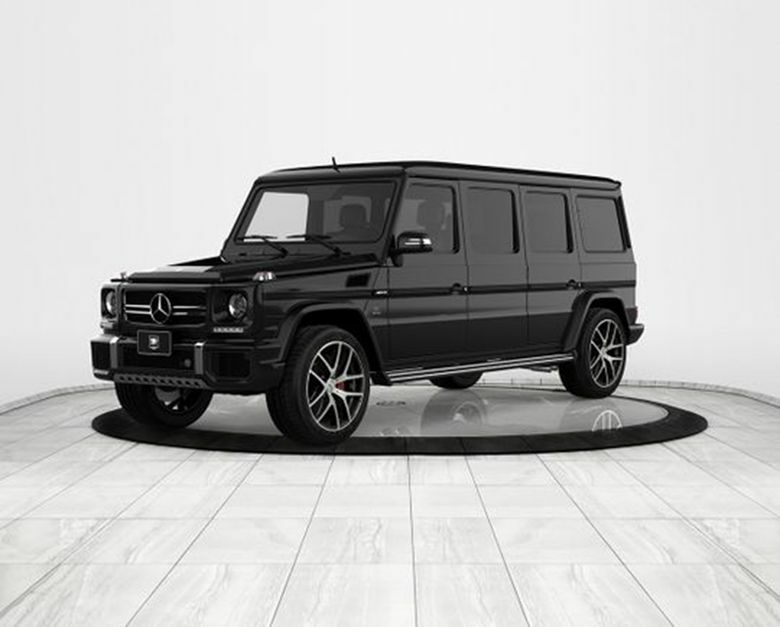 Last year, INKAS built the standout $1.13-million Mercedes-Benz stretch G63 AMG limousine for a “high-ranking executive in Europe,” said Yurovitsky. “It’s an armored office on wheels that’s set up for you to be more comfortable than you are in your real office,” said Yurovitsky. Another is the Mercedes-Benz Sprinter limousine van that INKAS builds, which starts at about $300,000. It will hold up to seven people, who can walk around in it while it’s moving, and it has working bathrooms, said Yurovitsky. INKAS has delivered “some” of the new Escalade ESV Chairman Package vehicles, with “many more” in production, the company said. 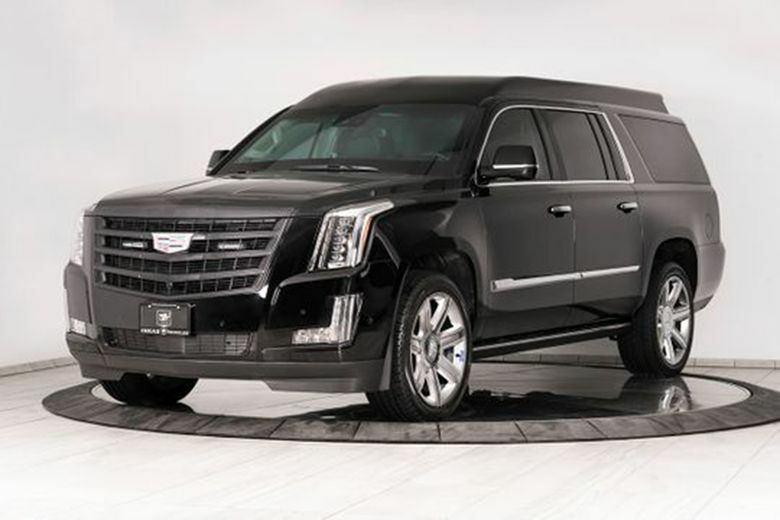 The Escalade ESV used for the Chairman Package has a 6.2-liter V-8 engine and a 10-speed automatic transmission generating 420 horsepower and 460 pound feet of torque. Its 130-inch wheelbase has a large passenger compartment to hold an executive office. It has Italian leather seats, exotic wood paneling, a mini bar with a liquor dispenser, air purification system, SmartTV, 4G LTE hot spot, advanced entertainment system with Apple CarPlay and Android Auto integrations and a 16-speaker setup. The Chairman Package includes power-reclining captain’s chairs featuring power ottomans, massage, heating and cooling capabilities with “in-vehicle lighting provided through the INKAS DayLight headliner system, designed to mimic natural daylight in order to promote a state of well-being,” the company said in a news release. It’s not all luxury though. The vehicle has a 360-degree closed-circuit camera system for security and the body’s armor shields against attacks from 7.62x51mm or .308 Winchester full-metal jacket ammunition. “You’re not going to see Walmart buying one of these things to shuttle their VIPs around in,” said Yurovitsky. “This is more common in South America, Africa, the Middle East, South Asia … where corporations will have these types of vehicles in their fleets, and they need it because their competing corporations have it as well.